Yesterday, a good friend and I practised mindfulness outdoors in her lovely orchard garden. As I stood in “standing mountain” pose, I felt the uneven soft ground under my feet, the caress of the air on my skin, and with eyes closed, the whole soundscape of birds and wind in the trees seemed to swirl around me as I swayed and balanced, breathing. 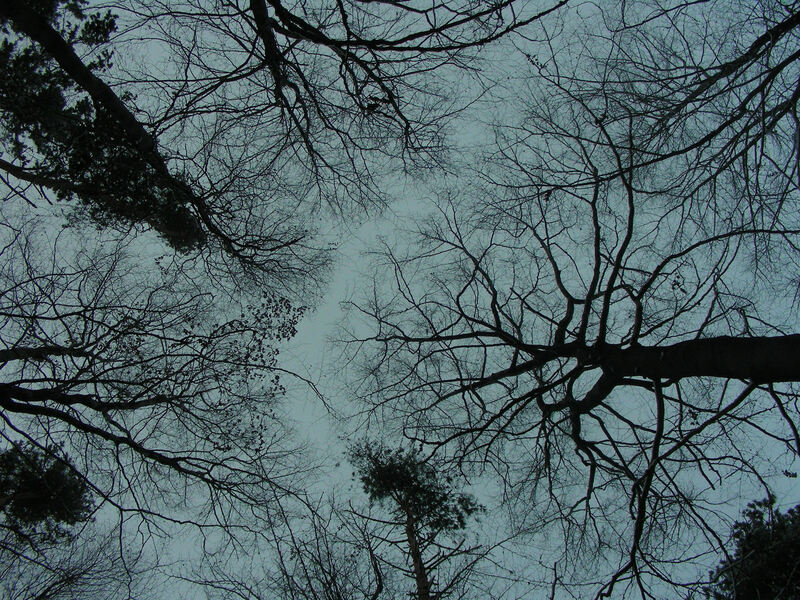 It was like being a tree, the closest I could come to that experience both of rootedness and connectedness to the sky above. It was a rich and fruitful pause, as refreshing in its own way as diving into a pool of clear water. So simple though. Just standing – something we can do at any time. “Standing meditation is best learned from trees” writes Jon Kabat-Zinn in Wherever You Go There You Are – his inspiring and accessible guide to daily life meditation practice. He suggests practising in this way alongside an actual tree, in a forest, by a stream, in your home or waiting for a bus. We forget that we can do this – take a pause in the tumultuous flow of our day to stand and breathe. There’s something very centering, wholesome and even revolutionary in its way, about just standing, not for any other reason than to connect with ourselves and our surroundings in the bare simplicity of present moment experience. – Waiting on the platform for your commuter train – consciously letting go of that forward focused, somewhat impatient, waiting mentality where the present moment seems like “dead” time, and instead, relaxing and breathing and expanding your awareness out from your own body and breath to the whole swirling scene around you. – At work or at home, when you’ve put the kettle on to boil and you’re waiting there with your mug and teabag ready, enjoy giving yourself permission to use that time to connect with the sensation of your feet on the floor, standing tall, breathing. – On a starry night, step out into the garden or stand by an open window with the lights turned off and enjoy the different sensations of being enveloped in darkness, cool air and night sounds. Or in the morning going out to stand in the dewy grass perhaps turned towards the rising sun, feeling the warmth on your face and chest. There are lots of other times and situations I could mention such as in queues, waiting at counters, brushing your teeth, in the shower, standing in a social group at a party, when walking the dog, or deliberately standing up when you’ve been sitting at a desk for hours. You could even do a formal meditation period standing rather than sitting, especially if you’re feeling sleepy or the opposite – very restless. Standing we naturally tend to feel strong and grounded, when we do it with awareness. And with all the research coming out about the harmful physical effects of our sedentary lives, you’ll be attending to your bodily health at the same time. Categories: meditation, mindfulness | Tags: daily life, Jon Kabat-Zinn, meditation, meditation practice, mindfulness, mindfulness practice, standing meditation, Standing Mountain, standing pose, Wherever You Go There You Are | Permalink.